Adrenal dysfunction is a very popular topic right now. I have recently been working with Hayley at Primal Palate to support her on her health journey (you can read about that here). We are making small upgrades and tweaks in her life to try to support her adrenal health and hormone balance and one of the additions to her life is a daily Adrenal Cocktail. 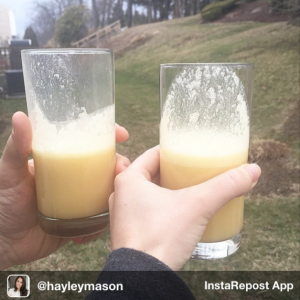 When she posted a picture of her Adrenal Cocktail on Instagram it spread like wildfire. It has affectionately been named the “dreamsicle” and the instagram community has already started upgrading the recipe by adding carrot, tangerine or ginger to the juice as well! The Feisty Kitchen even used her fabulous photography skills to make this look like the most appetizing drink there is! Here is a little bit of background about this recipe. I learned about the Adrenal Cocktail from my mentor Christa at The Whole Journey. Her recipe is a slightly modified version of the traditional Adrenal Cocktail (the original recipe is orange juice, cream or tarter & Himalayan pink salt). When I was in the depleted phase of adrenal dysfunction, this dreamsicle saved me! I drank the Adrenal Cocktail every morning for about a month while I was balancing my hormones. The most notable difference was my energy and the ability to finally regulate my blood sugar. I found that I wasn’t crashing mid afternoon, craving sugar or getting light-headed as much as I used to. Blend it up into a delicious creamsicle and drink 1-2 times a day an hour before or after food. This might not be for everyone. You always need to consider your personal situation when implementing a dietary or lifestyle change. I have had clients try the cocktail and feel horrible because of an issue with bacterial overgrowth!! Drinking a daily creamsicle is just one of the many life changes that I made and by no means a quick fix for your adrenal glands. You can find some other steps to start taking here. If you have been “diagnosed” with Adrenal Dysfunction (often called adrenal fatigue) don’t stop there. Start digging for the root cause. What caused the imbalance? Adrenal Dysfunction is an imbalance of hormones. The problem is very rarely actually the adrenal gland itself, but instead there can be a breakdown anywhere in a complex relationship between the Hypothalamus Pituitary Adrenal (HPA) axis. Anything that helps “restore the adrenals” is really just a way of helping to balance hormones and blood sugar, and therefore puts let stress on the thyroid, detoxification and every other function in the body. In the meantime, while you are doing the deeper work, you can replenish your body with this cocktail. Do you feel like you need a group for guidance and support on your Adrenal balancing journey? The Healthy Hormones Group Program starts September 15th!! This 12 week program will get you access to the hormone and neurotransmitter labs and a customized protocol. With biweekly videos, emails & support in your inbox we will go step by step through how to support your adrenals and balance your hormones. Photo credit: The Feisty Kitchen – check her out for her fabulous recipes!! Is this ok to drink during pregnancy? I haven’t been diagnosed with adrenal fatigue, but my energy is lacking (albeit pregnancy related) and I’d love to keep my sugar cravings at bay! Thank you! As long as you aren’t sensitive to the ingredients it should be fine during pregnancy. It would definitely be great to get any extra energy you can 🙂 As always, especially with pregnancy, check with you physician if you are concerned! Hi, I just wanted to share my opinion of what I truly believe is one of the major triggers of adrenal fatigue in this whole Paleo movement. My symtpoms are heat waves creeping over inside my brain and in my stomach, very severe anxiety attacks, so bad we didn’t know what it was. Uncontrollable shaking, shortness of breath, racing heart beat, body is terribly warm but yet no fever, ending all with bad digestion and endless bowel movements, probably because of the fear and stress of it all. A 5 lb weightloss and extreme dehydration for each attack I have. I had 2 in one week 2 weeks ago. My gut instinct tells me that “low carb” is what did this to me. When I embarked on bulletproof, that’s when all this crap started. It started with a minor and seldom attack, to more frequent and more severe, to nearly almost every day now. Adrenal fatigue can leave you crippled, I was hospitalized 3 times because of it. After doing so much research, reading Paul Jaminet’s work on the ‘dangers of low-carb’, and Lara Briden’s work, she’s got an article called “Your hormones need dinner”, and countless others explain the science on why low carb is dangerous for our thyroid and our adrenals. There is nothing wrong being Paleo, but beware when you read up or hear about these paleo “gurus” that make these outrageous claims on how low carb is best, especially super low carb, they practically demonize fruit and safe starches that we need. Many say, you should only consume safe starches if you’re an athlete. I went from eating one fruit a day and one starch a day and often no fruit or starch and just other types of veggies thinking I was doing myself good. Well, that was short-lived. Now I’m paying the price, and I’m nourishing myself back to health eating fruit and starch with every meal, even snacks, carrot sticks, my juices are important, and I’m taking supplements to help regulate cortisol. I have to drink a litre of electrolyte solution on a daily basis until this is all over. I’m seeing improvement, it’s slow, but at least there’s improvement. Low carb is dangerous. Been there, done that, moved on. Life is too precious. This has been such a frightening time for me, and I just wanted to share. Women especially, YOU ALL NEED CARBS. God put fruit and potatos on this earth for a reason, don’t do what I did. I know every body is different and has different needs, but I’m reading so many cases like like mine nowadays, and it’s all because of this low–carb movement. Wishing you all a healthy life and that you never have to endure what I went through. I don’t even wish adrenal fatigue on my worst enemy, not that I have any. So sorry about everything you have dealt with Anita! And I really appreciated you sharing this because we see the effect of low carb in our women clients daily and how it has harmed their hormonal balance.. I’m glad you have figured out a good balance for you! hi Ginger. I’m a diabetic and feel I need to eat low carb as I want to avoid pills and insulin. I have adrenal fatigue also. On my keto group they say I need to fix my adrenals first before I go lchf. What do I eat in the meantime since carbs aren’t good for me? I have adrenal issues too that I have only just diagnosed (2 years later!). Anxiety had increasingly gotten worse with skin sensitivities and an inability to lose weight (perfect diet and perfect amount of exercise does NOTHING!). I’m 60% sure this stemmed from going low carb Paleo diet. No fruit or starchy carbs, not even a sweet potato for weeks at a time cause I wanted to lose weight! And I did, maybe 3 kgs, but then very slowly, it began to creep up (I’ve gained 11 kgs in the past two years). Even with the introduction of carbs, my health is sub-optimal compared to before that diet. Got a cortisol test and it was shocking! Majorly dysfunctional. So now, I’m trying to heal it and hopefully my issues resolve with it! I know your post is a few months old but your situation sounds EXACTLY like mine. My nutritionist has just advised me to increase MY CARBS (I was doing same paleo diet, no fruit or carbs, etc and have been hospitalized 3 times too, my cortisol is in the tank). Anyways, my question is what supplements are you on and what seems to be working for you? I am dabbling with Adrenal Support, Licorice and DIM (high hormones with this too). DIM caused another attack so I am off it now (at least we think thats what it was). Any other suggestions would be awesome. Does the adrenal cocktail work for you? I’m making this tomorrow morning and I’m pretty excited about it. I’ll check back with results. Thanks for posting. I’ve been curious since I saw Hayley post a picture. I’m assuming this would not be recommended for those with severe systemic candida….. Due to the sugar in oj? Hi Stacey, you are correct this would probably not be a good idea for you. I like to have clients test things and see how you feel but you know yourself best! Why not just throw a whole orange into the blender for this drink? Wouldn’t it be beneficial to have the added fiber? Hi Amy, that sounds like a great idea!! There is no reason that you couldn’t keep the fiber in the drink. Does the collagen need to be purchased? Or can homemade bone broth work? We live in Central America and do not have access to purchase many health products. Casey if you can’t get health products like collagen than you could definitely use your bone broth. Of course it wouldn’t be quite as delicious but you will be getting the health benefits! Is this something that could be made in larger batches to have on hand for several days? Or should you drink it immediately? Hi Jennifer – I used to make a few days worth and keep it is a large container. The only thing I found is that it needed a good stir before drinking but other than that this would be a great time saving idea! Wellness Beets Episode 10 Show Notes | D.I.G. Would you know if it would be safe to consume if you have high blood pressure, because of the salt I mean? And, would the Great Lakes Gelatin Collagen Hydrolysate work for this adrenal-cocktail? Please let me know and thank you so much. Using highly processed iodized salt in this drink would be dangerous for someone with high blood pressure but using high quality pink salt that still has all of the minerals left intact does not have the same effect (check with your doctor of course!). Great Lakes Gelatin is fine from a nutrition perspective but the drink will thicken up quickly and will be hard to drink, so the collagen is a better choice for this. Hi, Which collagen to use? On webshops I find type I, II or III. What’s the difference? TIA. Christel – I have been using Vital Proteins collagen. I can’t seem to find anything in their literature to say whether it is I, II or III. Sorry, I don’t know what those different types mean. Where is the potassium source if you remove the cream of tartar? That is vital for adrenal function (Vit C, sodium, and potassium) and the goal of the AC. Hi Brandon, this is a great point and some of my clients have added coconut water as well as a source of potassium. I was taught the cocktail without the cream of tartar and it worked amazingly well for my adrenal recovery but I think that it is important for people to test what works for them and keep an eye on their hormone and cortisol levels. Hi! I found you on Instagram and immediately started following you because I’m in adrenal fatigue and hormone imbalance. 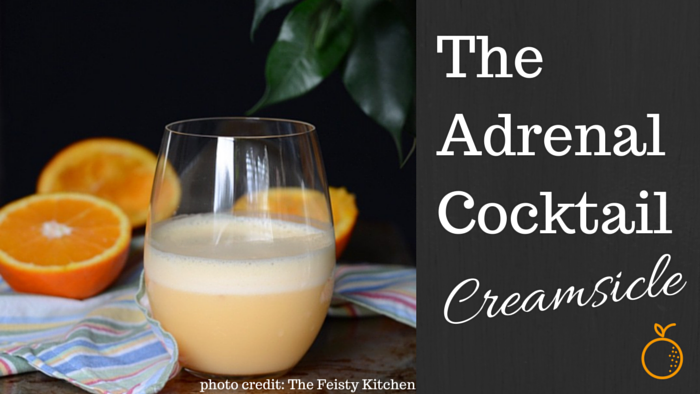 i want to start using this Adrenal Cocktail, but coconut cream gives me diarrhea and I’m intolerant to dairy. Any suggestions for the cream in this recipe? Hi Kartrina! That makes is a little tricky huh? I know that one reader was using raw eggs for that reason (but she always consumes them, has a good source and felt good about that) but I can’t recommend that. You could follow the original recipe and try cream of tartar? Can you substitute organic, whole milk yogurt? Coconut cream is not easily found here and neither is raw cream… I would drinking this quite a bit and would want to make sure I could get the ingredients easily. Thanks! Recognizing that cold-pressed or fresh squeezed would be optimal, is bottled orange juice a reasonable option? Yes Lisa just get the best quality that you can! And I remembered why I don’t drink orange juice…I t brings on rosacea! A week of this yummy cocktail and I’m horribly broken out! It’s too bad as it has solved my hormonal/blood sugar nausea in the mornings. I’ve been using this for about 2 weeks now and feel like I have more energy. Question: I travel a lot and can’t take liquids on a plane. Any ideas for an ‘on the road’ substitute? That’s great Denise! If you could bring the collagen and pink salt with you for ‘on the road’ you could add that into a juice or smoothie that you buy. If you find a smoothie that has some added fat like almond butter or coconut milk that would be a good option. It won’t be a prefect solution but at least you will still be getting some minerals and protein!! The beef gelatin you linked to is the kind that gels up. It’s really hard for me to drink since it gets all clumpy. Is there a way to make it into jello or something? Oh no, thank Jodi for bringing that to my attention! It was supposed to be linked to the collagen peptides not the gelatin. I just changed the link but in the meantime the gelatin will make great gummies or jello. I used to use the gelatin in this drink but would have to chug it down really quickly!! Can you take it you are on bioidentical hormones cream and taking adrenal supplements? Check with your practitioner who put you on the hormones, but in general there is no reason not to do both. Coconut Cream — The solids from a can of coconut milk after refrigerated? Or the can’s they sell at Trader Joe’s? Hi Marissa, some stores sell the actual cream in a package but otherwise you can just scoop the solid stuff off of the top of the can! Before I saw your site, I was introduced to the Adrenal Cocktail – the version using just orange juice, pink salt, and cream of tartar. I used water instead of juice, due to blood sugar concerns. It seems that I do better with only the pink salt in water, without the cream of tartar (though I have no idea why!). But now that I see your recipe, I’m wondering if I should be adding more, instead of just drinking the salted water. I did just purchase some natural Vitamin C powder (from cherries, I believe), and today I added that to my salt water. I do have the collagen peptides, and it never occurred to me to add that, but I can easily do that from now on. If I add some fat, would that cover all the bases? I guess I would still be missing a glucose/carb source. Any suggestions besides juice? Hi Tara! Just adding pink salt to water is fabulous for the adrenals as well so that is always an option. I like your idea of collagen, vitamin C and pink salt in water and then you could add a little bit of raw honey. How does that sound? Is there a substitute for the collagen? Are you looking for a plant based protein option? I haven’t experimented with anything other than collagen & gelatin. Sorry! Just curious, what is the reason for taking cream of tartar out of the original recipe? Hi Rachael – I first learned about the recipe without the cream of tartar but I know that some people seem to get a laxative effect from it and they end up dehydrated! Hello! Thank you so much for this post, so informative! I was wondering if kosher, grass fed beef gelatin can be replaced for the collegian. My understanding is that the gelatin still contains collegian and the protein what this recipe is going for. Thank you!